Automatic Call Recording has never been easier. With Automatic Call Recording Pro you can record all Incoming and Outgoing voice calls during the call and on auto-pilot. 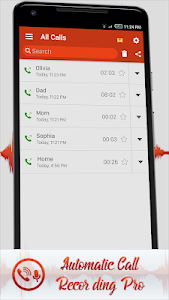 Automatic Call Recording Pro is a simple, free, smart and easy to use auto call recorder app for all android phones that records phone calls from both sides with high quality and clear voice. Never worry anymore about losing important call recordings. Record phone calls and save recorded calls with ease with this automatic call recorder. It is the best recorder for sound recording with high quality. 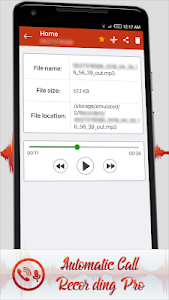 Automatic Call Recording Pro app allows you to record phone calls and manage recording files in a smart way with a lot of features like play, listen, share, delete, trim recordings and rename call recordings, multiple audio formats, add to favorite, voice recorder etc.
? 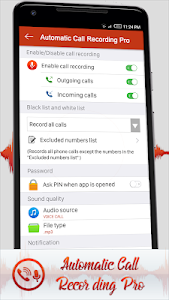 Automatic Call Recording Pro is the best app for you to record all your calls. By using this app, you can record all your calls automatically and save all your phone calls. The entire call is recorded and saved on your phone and only on your phone. Your recordings are private and are not saved on any third party server. With Automatic Call Recording Pro you can also record calls secretly without any notification. 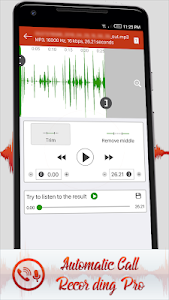 This app helps you to record all incoming and outgoing calls automatically with a very good high-quality sound that provides our sound recorder without limits of time. It is simple and easy to use. With Automatic Call Recording Pro, you can record any phone call you want and choose which calls you want to save. You can set which calls are recorded and which are ignored. You can set a list of numbers that will be excluded from recordings. You can also search for your recordings by contact name or phone number. Automatic Call Recording Pro offers a lot of features that will allow you to automatically record a call. - Easily manage all your recordings. - Record calls secretly: the app allows you to show or hide the app icon on status bar when recording. Take control of your phone calls with Automatic Call Recording Pro and record any phone call you want. Automatic Call Recording Pro is your new choice for both side voice phone call recording: incoming and outgoing calls. It’s the best app for you to record your calls. Get it now!
? 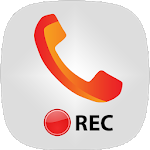 Automatic Call Recording Pro supports All Android Devices including Samsung models: Note4, Note5, Note8, S5, S6 & S7, S8 variants…, LG, Motorola, Sony Xperia c3 c5, HTC, Huawei, j7 prime, xiaomi, j2, j7 max, Nokia… and many others. Some phones do not support call recording properly due to capabilities of the device or Android version each brand/model have. Thank you for using Automatic Call Recording Pro. If you have comments or suggestions, please contact us. Similar to "Automatic Call Recording Pro"